Fantastic weather for our annual trip to the Toledo Speedway! Great racing in all division was on hand for who attended the event. 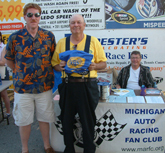 Our MARFC Bag was presented to Sportsman driver # 4 Norm Lewallen for his longtime dedication to the speedway as a driver. The winner for the MARFC members raffle was Timothy Bihn. 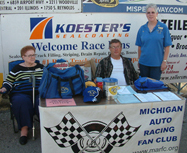 Volunteers on hand for the night at the MARFC table were Fran Russo, Rob Michon, Sue Ginter and Jack Lecot. Many thanks to Ron Drager, Roy Mott, and Scott Schultz for another fine night of racing this year!